An eclectic mix of promoters, yoga instructors, MMA fighters and tattoo artists amongst other professions are coming together in Hangar tonight to share their experiences with Mental Health and Suicide and to offer guidance to those in attendance. 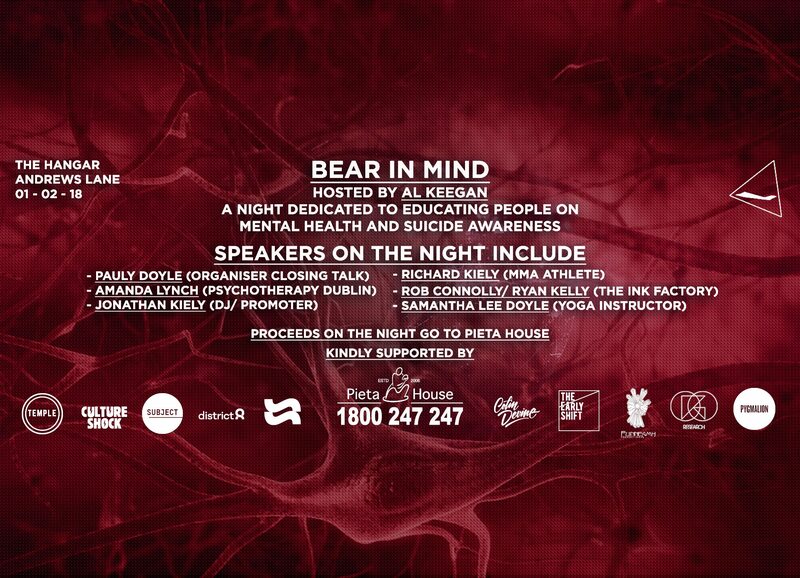 A panel consisting of Pauly Doyle, Jonathan Kiely, Richard Kiely, Amanda Lynch, Rob Connolly, Samantha Lee Doyle and Ryan Kelly will be on hand on the night to share their stories with the room in order to spark a much needed conversation about Mental Health especially given the number of suicides in 2017. Hosting the talk in a space like Hangar brings the night closer to the clubbing community, along with representation from prominent figures within the scene; one that’s desperately in need of such a discussion, with so many young people regularly attending electronic music nights every week but also being scourged by mental health issues. Read our feature on mental health among young clubbers here. You can get involved on the Facebook event here. Donations can be made to Pieta House made on the night.